Events across the country will be held to celebrate the expat population as part of Together Day. Officially falling on May 20, Together Day was introduced as a nationally observed celebration in 2008, as part of the Act on the Treatment of Foreign nationals. Most areas with a significant population have events, although some are held at other times of the year. One of the biggest is the Global Gathering in Busan. The Busan celebration was started in 2006 before Together Day was created , but has usually been held in tandem with it. The event that takes place on Sunday includes stage performances and cultural stalls and booths where local expat organizations can introduce what they do and companies and other organizations can promote their services to foreign nationals. Organizers said over 130 organizations from 41 countries to participate. 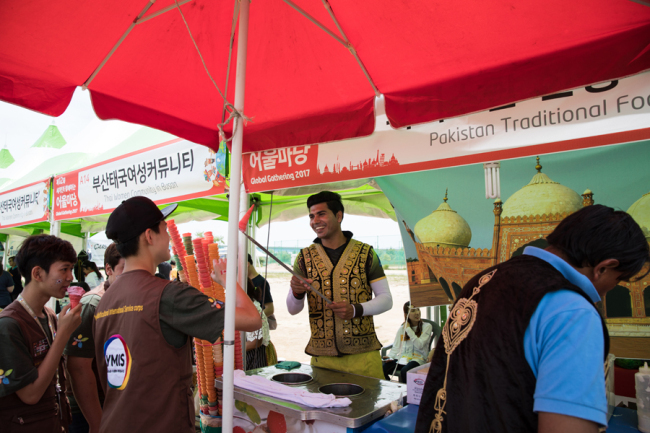 "The BFIC’s main hope for this year’s event is for the ‘Global Gathering’ festival to be more of an experience-oriented and educational event, so the participants could experience, feel, and embrace the diverse cultures of the world," said Kim Yu-jin of the Busan Foundation for International Cooperation, which is co-hosting the event. She added that the festival would include a Global Parade for the first time as part of this. The festival opens at APEC Naru Park at 10 a.m., with the parade from 11:30 a.m. until 1 p.m. In Gwangju, a similar event will mark Together Day on May 27. The date is a week later than the official day to avoid clashing with commemorations for the 1980 Gwangju Democratic Uprising. The format is similar to Busan with stage performances including a traditional dance by a Vietnamese community in Nam-gu, a martial arts demonstration by residents from East Timor and Zumba from Thando Mlambo, who runs a regular class at the Gwangju International Center. Market stalls and other booths will also be open. There is also a May Concert, now in its 16th year, to be held on the same day. The concert features classical music and traditional songs from around the world. Attendance is free but tickets are required, with information available at gic.or.kr. In Seoul, a commemorative event will be held at the Inchon Memorial Hall at Korea University where awards will be given to people who have made outstanding contributions to the social integration of foreign residents. The winners of a photo and essay contest will also receive their prizes at the event. Performers at the Seoul event will include Sonya, a Korean star of stage musicals who has spoken about difficulties she faced growing up mixed race. Other performances will come from a taekwondo team made up of refugees from Myanmar, a K-pop dance team of Goryeoin (ethnic Koreans from Central Asia), a multicultural children’s choir called Beautiful and a performance from the musical Hamilton by members of an alternative multicultural school. In total, about 50 districts will be hosting events. More events will be at Chuncheon Hoban Gymnasium on Friday, Daegu’s Department Store Plaza on Saturday, Incheon Grand Park on Sunday, and Daejeon’s Boramae Park on May 27. A full schedule of events is available at togetherday.kr, though the listings are in Korean only.